Is it watermelon season where you live? Around here, it is almost the time of the year when we will see trucks full of watermelons on the side of the road for sale. Sweet, juicy watermelon is a sure sign of summer! We only have a few days left in preschool and my big kids only have a couple of more weeks until summer break. 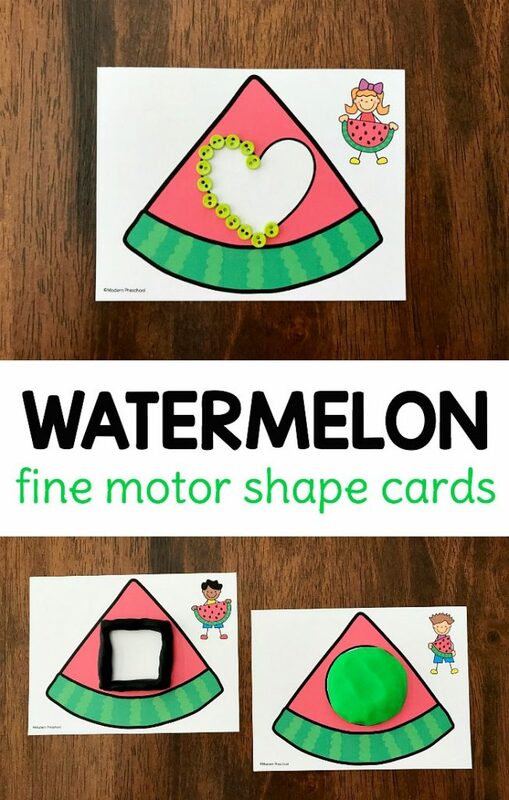 It seems like the perfect time of year for our watermelon fine motor shape cards! 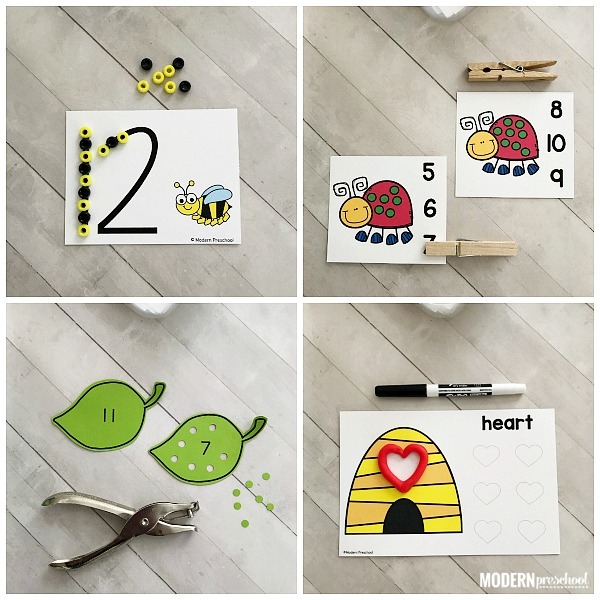 Practice shape recognition, shape formation, and fine motor skills in lots of different ways! This set of printable watermelon fine motor shape cards includes 12 individual cards. Each card has a different shape on it. To prep this math center or busy bag, print the file below. Cut the watermelon cards apart on the gray dotted lines. If these cards will be used with play dough they need to be laminated or put into a pouch protector (or even a resealable freezer bag!). If not, definitely still print on cardstock for extra durability when used with little hands. 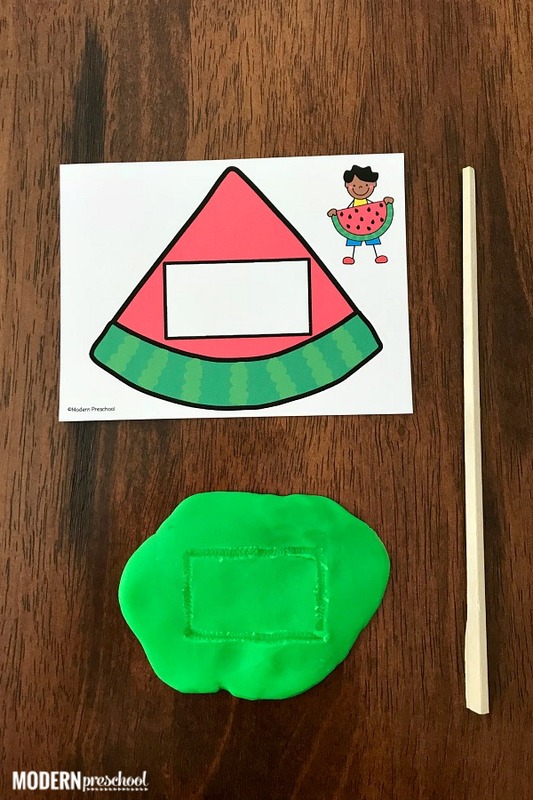 Once everything is prepped, I like to put the watermelon fine motor shape cards into a small plastic bin or basket along with any other supplies needed. This way it can be cleaned up easily by preschoolers. Gather the fine motor materials and supplies needed to build the shapes. The goal of the watermelon fine motor shape cards is to identify the shape on each card and then build the shape. Our favorite ways to build shapes, letters, and numbers is to use mini buttons, pom poms, play dough, and writing trays. Pick a card, lay it on the table, and identify the shape on it. I always like my preschoolers to trace the shape with their finger first. Sometimes if we are sitting on the carpet in a whole group setting, I will even have them draw the shape in the air. This gives me the opportunity to point out where we start the shape, how it’s formed, and for the kids to practice direction following. 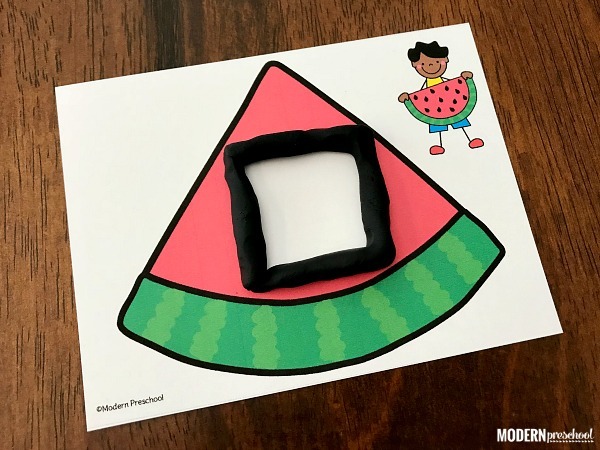 There are SO MANY ways to use the watermelon fine motor shape cards! Trace the shapes with pom poms! Use kid-friendly squeezers to pick up and place each pom pom in place for added fine motor practice. Use play dough to build the shape! Roll out a “snake” with play dough and form the outline of the shape. You can also fill the shape with play dough instead of tracing it. One of our favorite activities is to squish the play dough flat and use a chopstick to draw the shape in the play dough and not on the card. Mini buttons take lots of concentration! One by one, pinch and pick up a button and carefully place it on the line of the shape. Be careful not to bump the ones already on the lines when placing the next one. This method is for more advanced preschoolers and not beginners. I am always a fan of preventing frustration! Don’t you just love how easily this one activity can be adapted and played in so many different ways?! 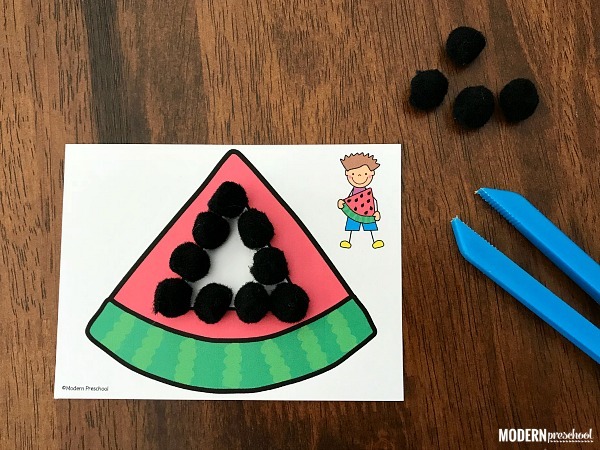 The very best thing about our watermelon fine motor shape cards is that it is a math activity that can be played over and over again. Throw all of the materials into a resealable freezers bag or small plastic bin with a lid until next time. 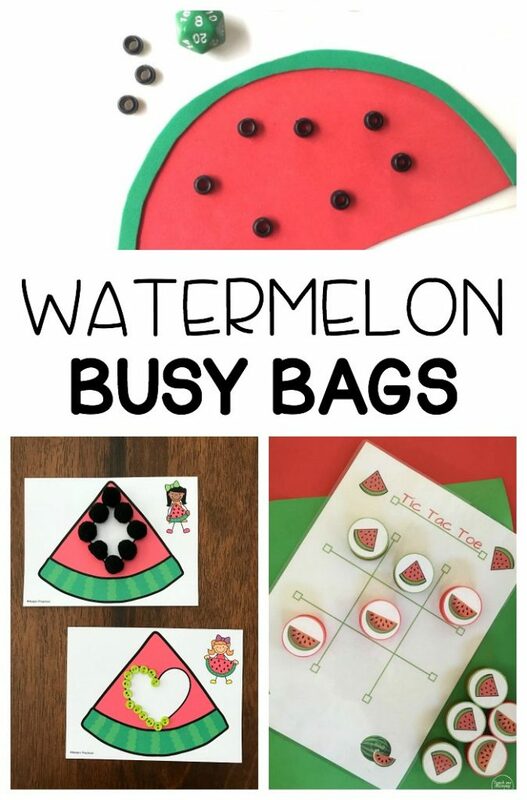 Need even more watermelon themed learning ideas? Check out all of these below! But wait! 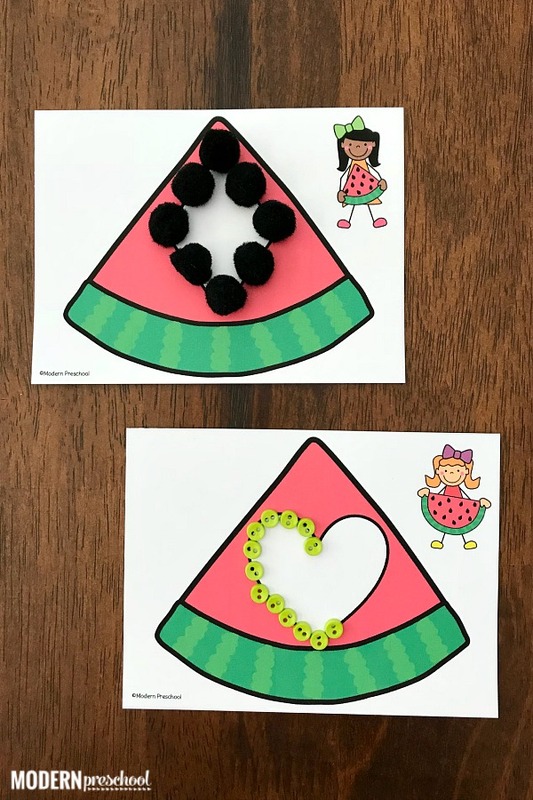 If it’s the fine motor part of the watermelon fine motor shape cards that you love for your little learners, you HAVE to check out our Fine Motor Busy Bins. You can see a sample of the Bugs Fine Motor Busy Bins below. Back to more watermelon ideas from some of my favorite preschool blogging friends!